The absolute king of ROF, and an absolute blast to use. 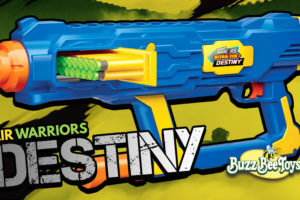 The Buzz Bee Destiny is one of Buzz Bee’s more exciting releases this year. 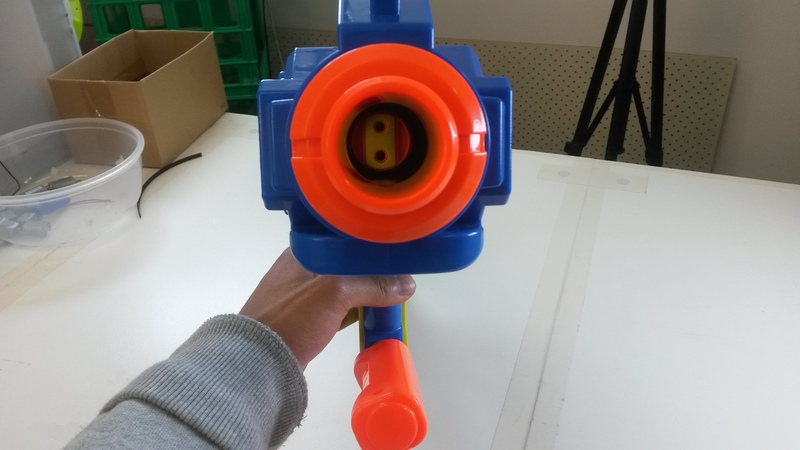 The old Nerf Magstrike is a favourite of many for its out-of-box ROF and awesome sound. 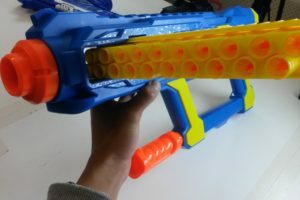 BoomCo’s Rapid Madness is in many ways a more refined version of the Magstrike, but the lack of Nerf compatibility is something that’s really hurt BoomCo. 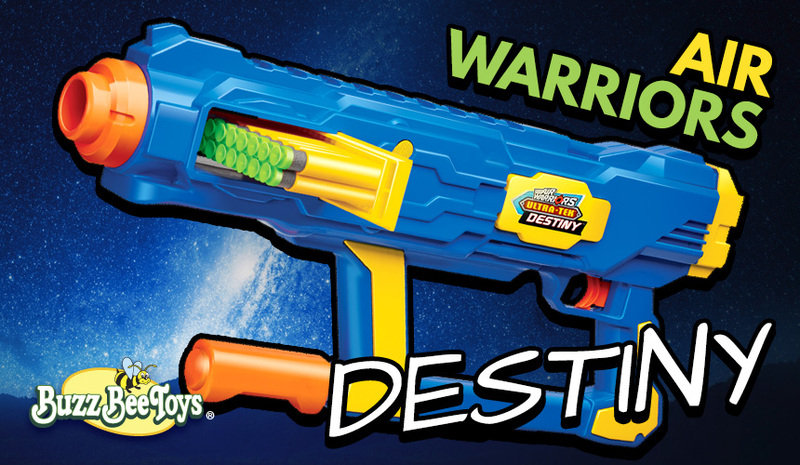 The Destiny offers a return to good old air powered rapid fire. 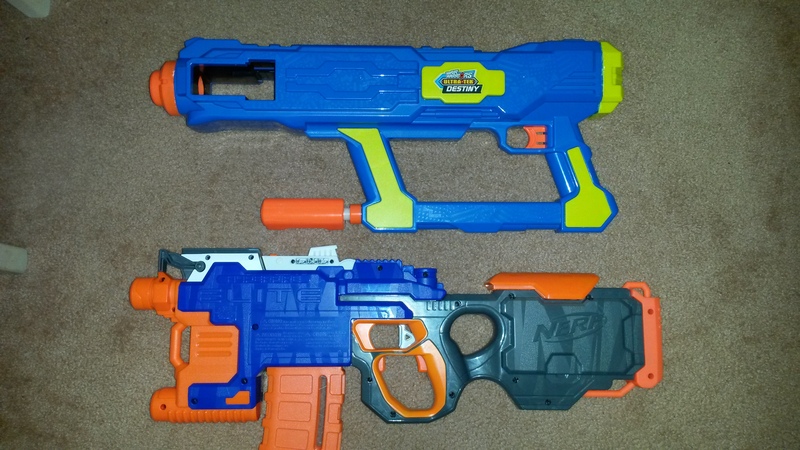 How does it stack up with today’s blasters, and how does it compare to the Magstrike and Rapid Madness? Everything in the Destiny package. 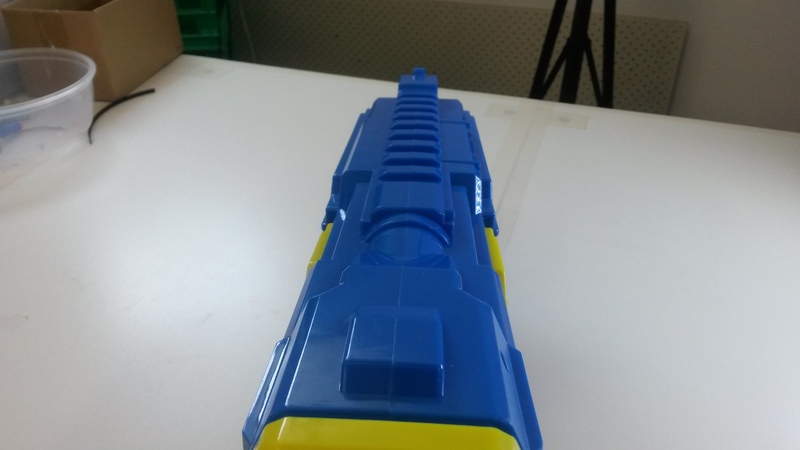 Disclosure: This blaster was sent to me by Buzz Bee Toys for review. 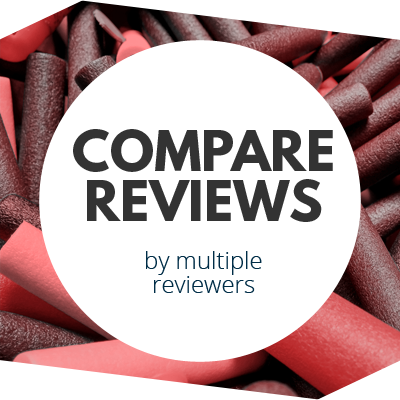 I would like to thank them for their contribution, however note that it will not bias the review in any way. The box is pretty standard Buzz Bee fare. 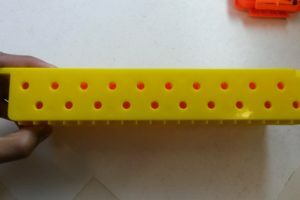 Cable ties secure the large parts, while the darts are contained in a plastic tray. The Destiny is quite a bulky, blocky blaster. 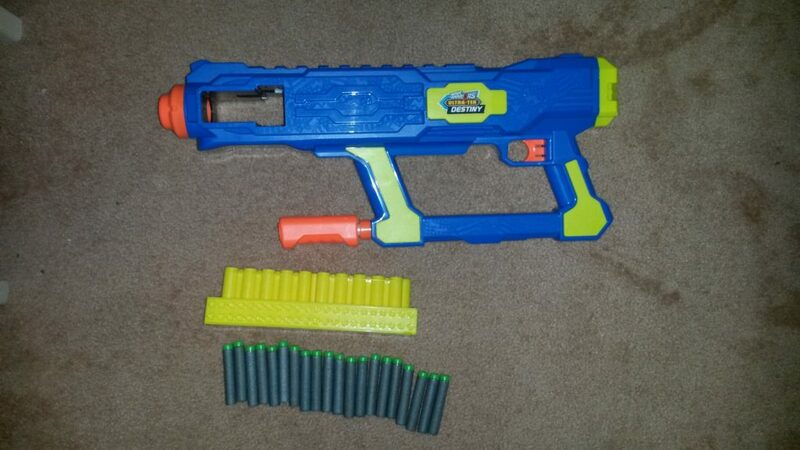 The main body of it is very wide, far more than most other blasters. 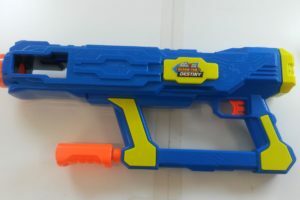 Despite its size, it does not feature any more detailing than a typical Buzz Bee blaster, besides the texturing. A lot of the plastic surface is still very shiny, and that combined with its simplistic design contribute greatly to the “cheap” look and feel. 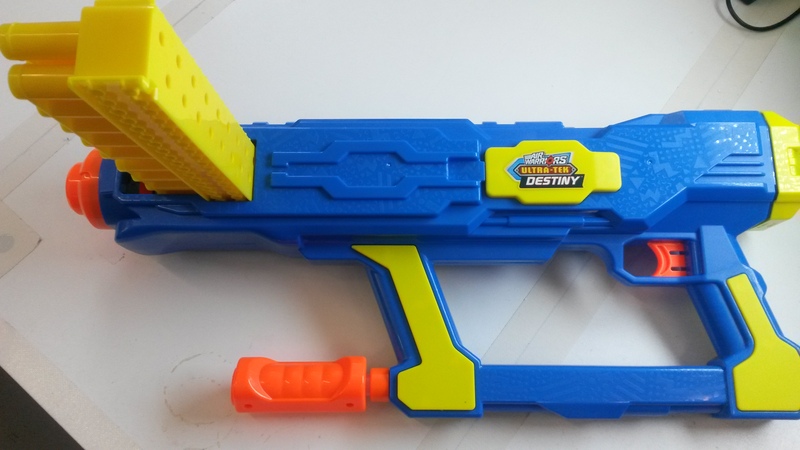 The plastic used on the Destiny is decent, certainly nowhere near as bad as some older Buzz Bee plastics, but still not Nerf level quality. 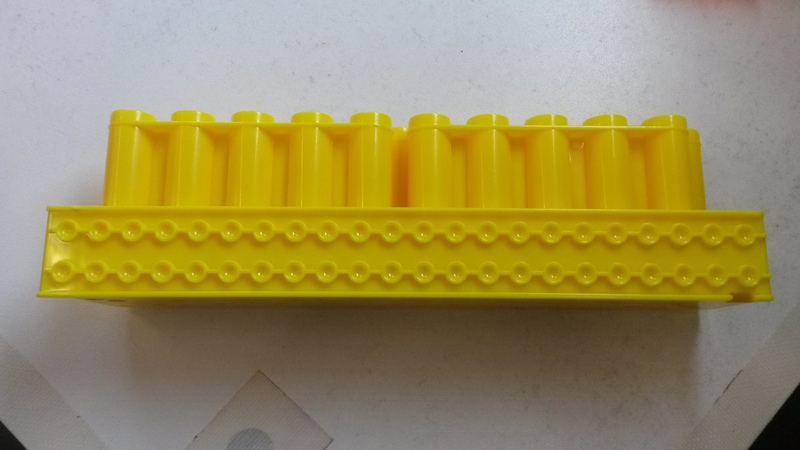 As is typical for newer Buzz Bee blasters, the yellow accents are all separate pieces from the main body. Having the handle at the back makes the Destiny very unbalanced, and a little awkward to use. 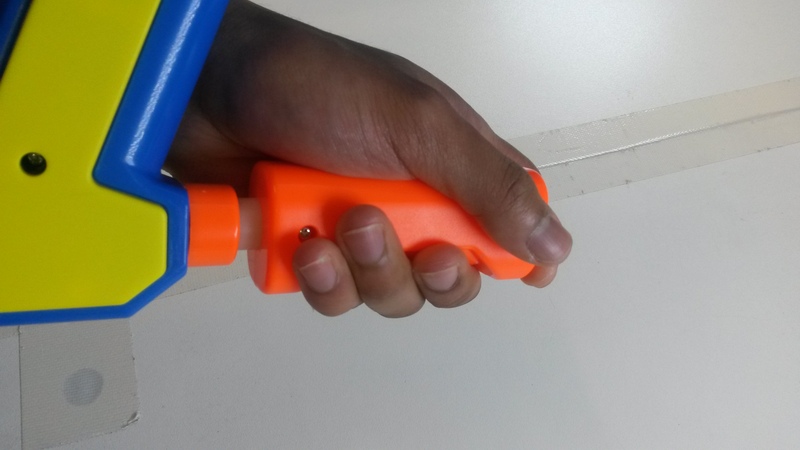 Though it is not particularly heavy, it is still more awkward to handle than most Nerf blasters. The Destiny is a very large blaster, certainly larger than what I expected. 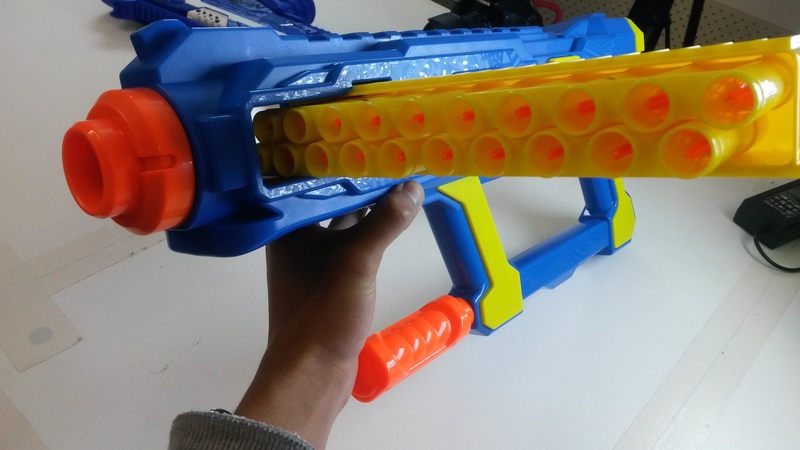 It’s almost comparable in length to a Hyperfire, and is substantially wider. 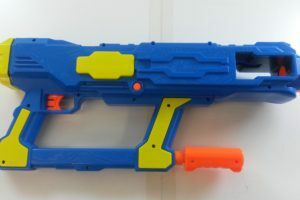 A setup like the Rapid Madness with the trigger on the front handle so that most of the weight is above or behind the trigger would have made it a lot easier to handle, and more compact to hold. Close up of the “fiesta” detailing. 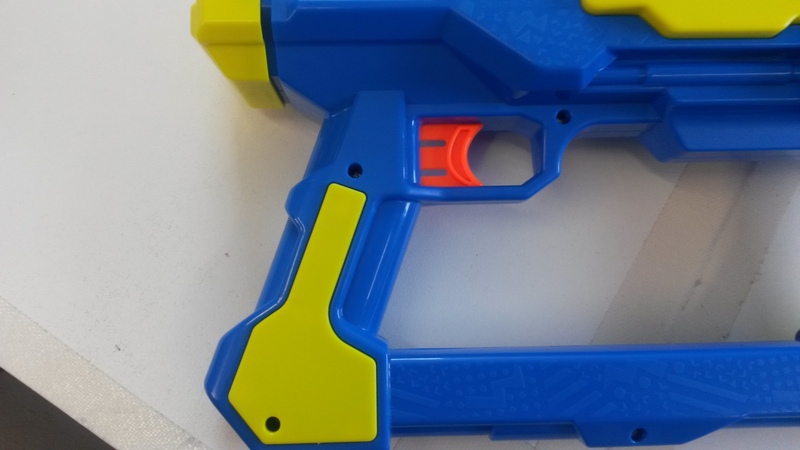 Something Buzz Bee has only just started to do is add texturing to the sides of their blasters. 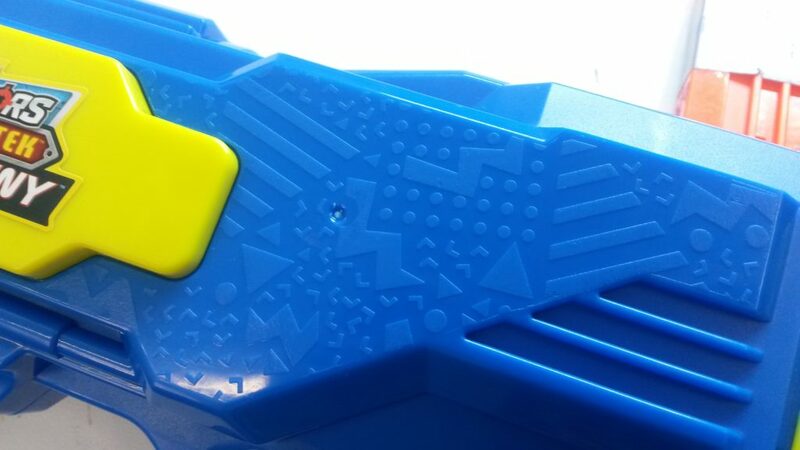 Pictured above is a texture pattern dubbed “fiesta” styling, and it does nothing but further distance Buzz Bee’s aesthetic design from Nerf. However Buzz Bee has confirmed plans to change the detailing to a “carbon fibre” texture. The first batch of blasters will still have the “fiesta” texture, but subsequent batches will feature the new “carbon fibre” texture. Close up of the pump. 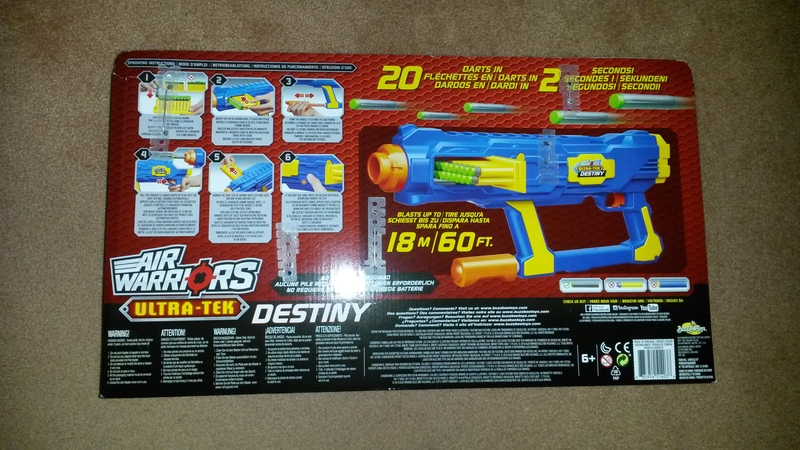 The Destiny is an air powered blaster, and has a hand pump running along the bottom of the blaster. 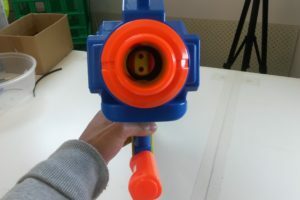 The pump is single action, though has a very long stroke of around 20cm. A double action pump like that of the Rapid Madness would have greatly reduced the number of pumps required, though as seen with the Rapid Madness, makes pumping much more difficult. 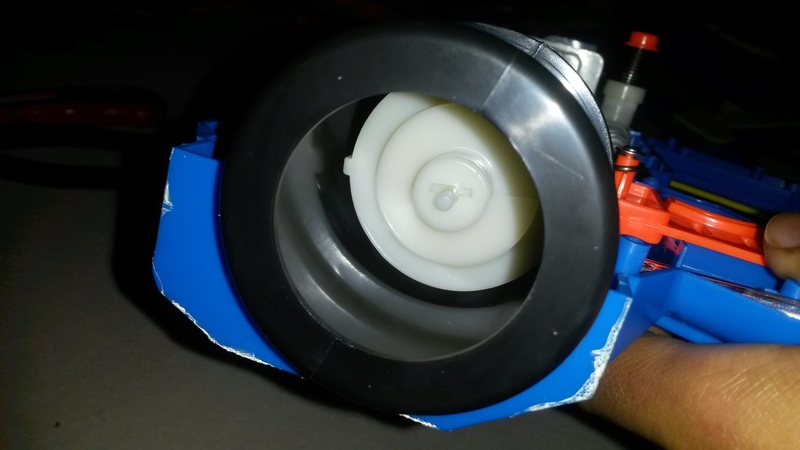 The pump handle is fairly small, and rotates around freely. Though it is reasonably comfortable for me to grip, I certainly would not want the pump to be any smaller. If you have larger hands, you may find the pump a little bit small. The handle is also decently sized, though again, while I find it reasonably comfortable, if you have larger hands it might be a bit squishy. My one complaint about the handle is the extrusion on the back, which I find is uncomfortable and rather unnecessary. Other side of the clipwell. Here is a close look at the Destiny’s clipwell. 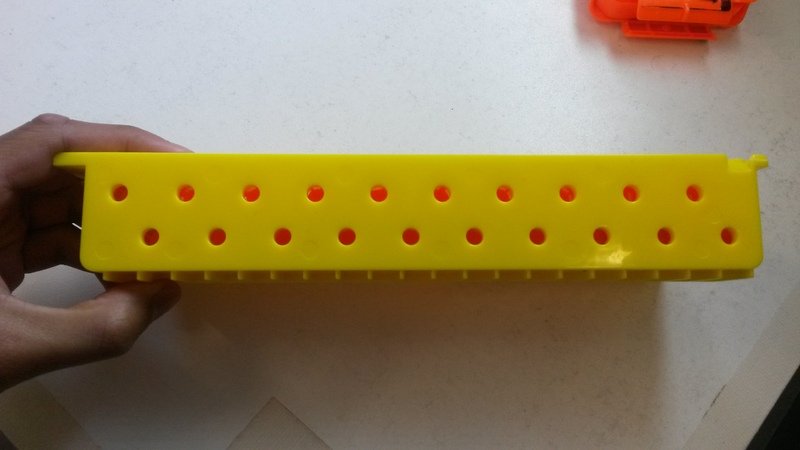 The small orange piece at the back stops clips from being inserted too far. This aligns the clip nicely with the firing mech. 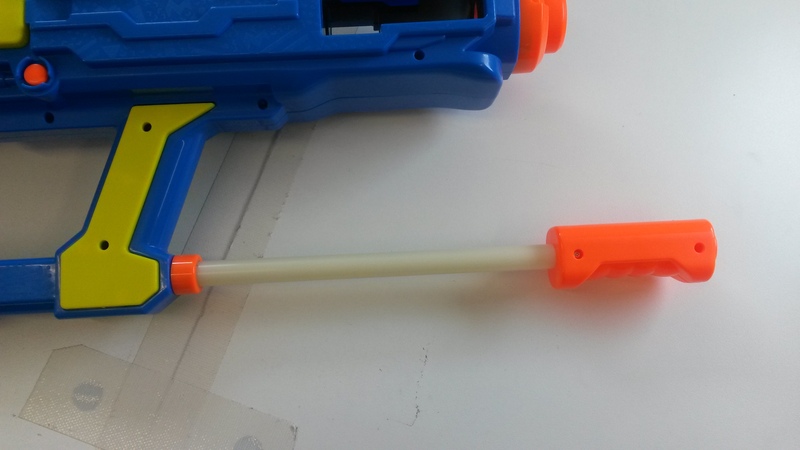 This piece retracts when the trigger is pulled, and is held back by the clip once the first dart has been fired. 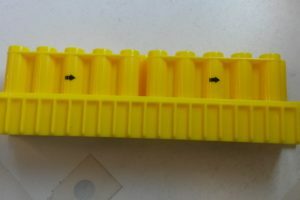 The bumps along the bottom help keep the clip in place. 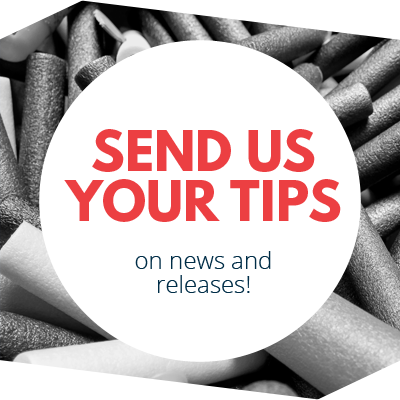 They keep the clip aligned during firing, and also help prevent the clip from falling out if not fully fired. 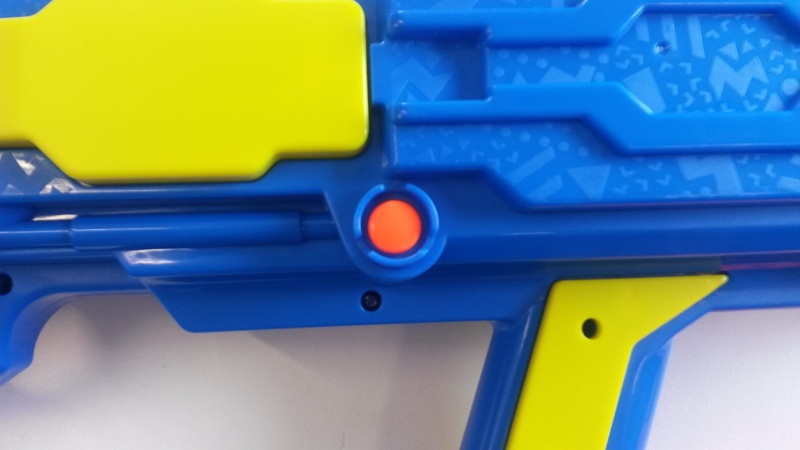 Close up of the “jam release” button. 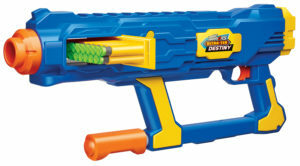 The Destiny features a “jam release” button on the right side, akin to the button found on the side of a Rapid Madness. It releases any remaining air in the firing chamber. This serves two purposes. 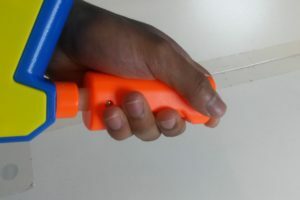 The first is its intended purpose, a “jam release”. 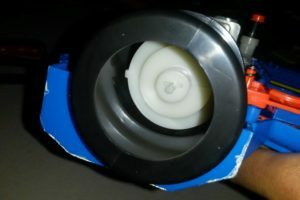 By venting the air in the firing chamber, the firing mechanism is reset and allows the clip to be moved freely, as it is possible to lock the clip in position. Though not explicitly stated on the box, the second appears to be the prevention of autonomous firing. 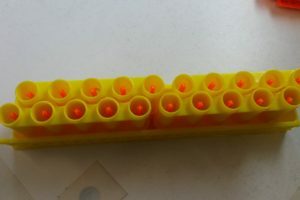 After firing all darts, it is possible for the firing chamber to collect a residual amount of air — not enough to fully fire and cycle the clip, but still enough to store pressure. 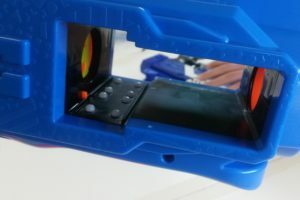 If left alone, it is possible for the blaster to suddenly and randomly fire the remaining air. The jam release handily eliminates this problem by completely venting the firing chamber. 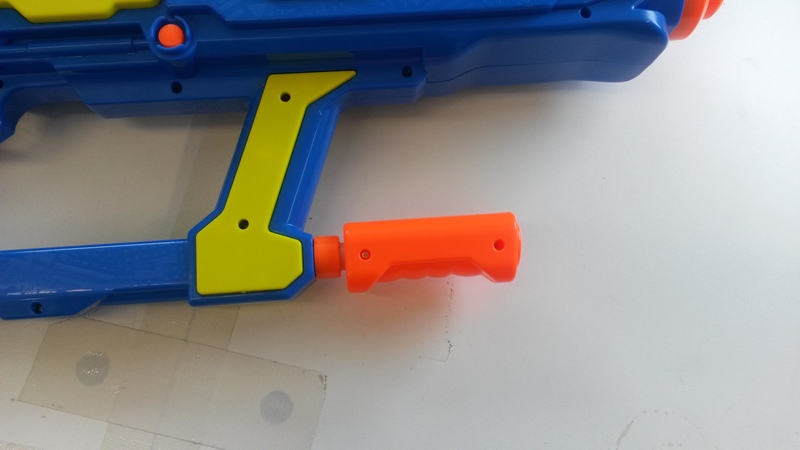 Next to a Nerf 18 dart mag. The 20 dart clip is a new, unique piece that has been specifically designed for the Destiny. It is reminiscent of both the Magstrike’s clip and BoomCo clips. 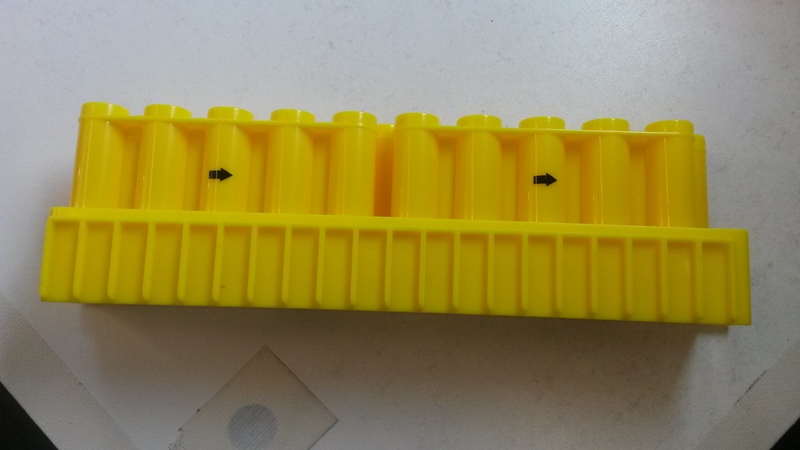 The top of the clip has arrows showing which direction to feed the clip in, and ridges for the advancing mech to line up the clips. The bottom has a number of divots to lock in with all the bumps on the bottom wall of the clipwell. Note the small cutout on the bottom of the clip. 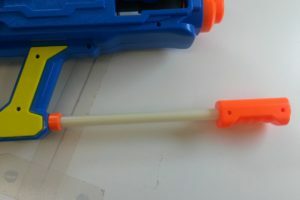 This catches against the small orange piece in the clipwell, which prevents the clip from falling out after being emptied if the trigger is released. It is simple, effective and also easily bypassed if desired, as holding down the trigger will allow the clip to drop out anyway. 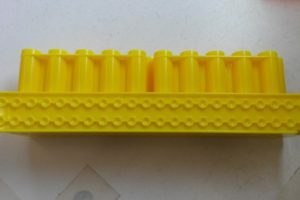 The “doublestack” design of the barrels allows shortening of the clip, however naturally increases width substantially. Furthermore, the necessity for full barrels for every dart increases bulk significantly. Front-ish shot to show the size of the clip. The Destiny is already quite a bulky blaster and is fairly unbalanced, even more so with the clip inserted. 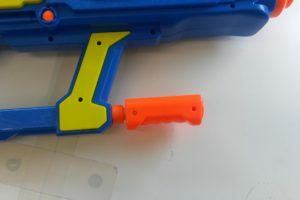 The clip adds substantial width to the blaster and more weight to the front, throwing off balance and handling even more. Like the Rapid Madness, the Destiny uses a sideways clip and clipwell. 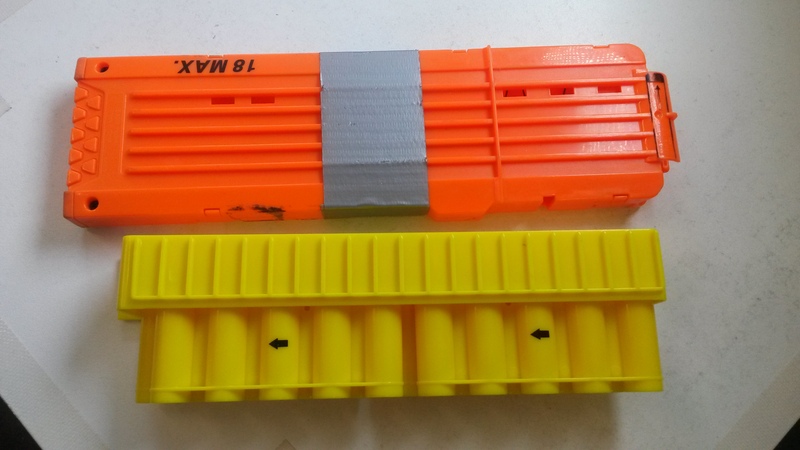 While this does introduce the issue of width, it also solves several problems that the vertical clip Magstrike had. 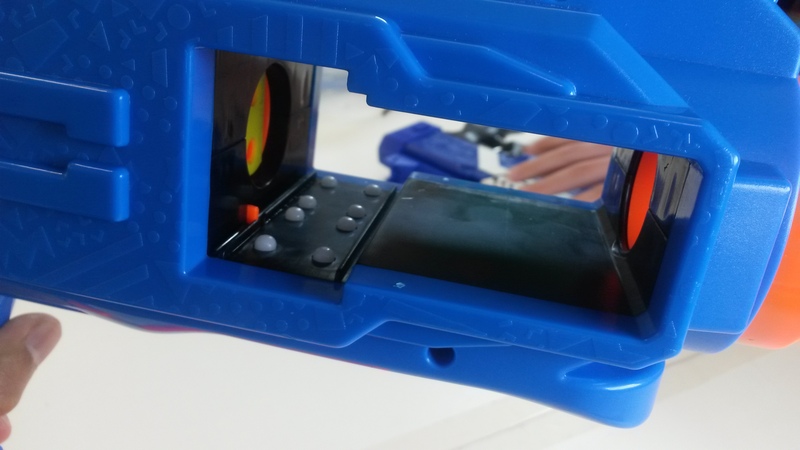 One of the main problems with the Magstrike stems from its vertical clip design. Clips that had been partially fired had a tendency to slip downwards, especially if jostled, which made burst firing a total pain. Additionally, some Magstrikes struggled to advance past the first dart if not held sideways. The sideways clipwell coupled with several other additions inside the clipwell allow the Destiny to avoid all of these aforementioned issues. 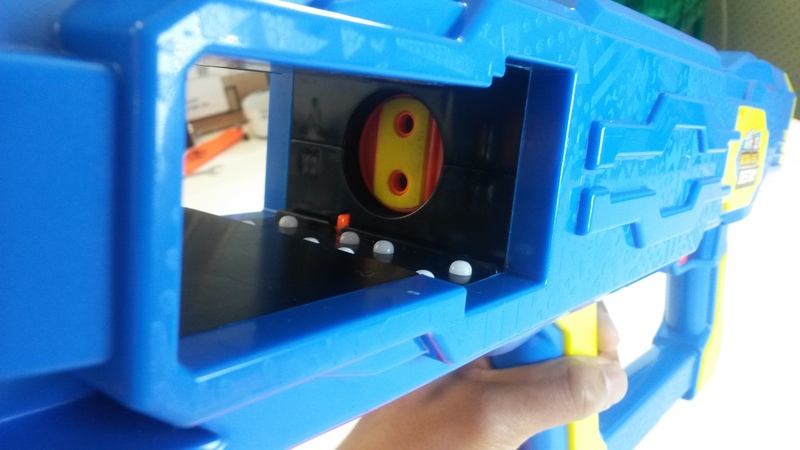 During firing, the clip will advance rapidly through the blaster, towards the right. 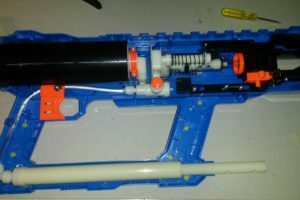 The blaster alternates top and bottom barrels, hence the need for a large muzzle. 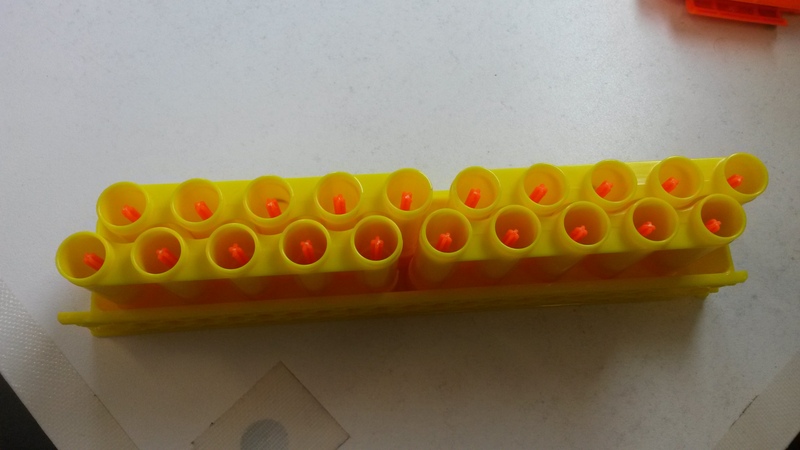 To fire off all 20 darts, the Destiny requires around 15 full pumps. More is, of course, preferred for insurance against any air loss. A good rule of thumb for pumping on-the-fly is 1 pump per dart (besides the first shot, which requires 2 pumps). The built in pressure release will kick in after around 20 full pumps. 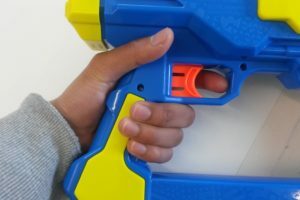 The blaster is full auto, so once the blaster is pumped up and loaded, simply pull and hold the trigger to let loose your darts. 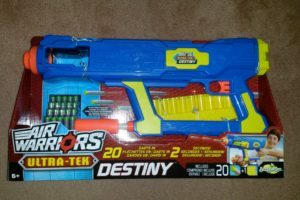 The Destiny’s range is decent, by typical Nerf “grey trigger” standards, at least. It averages 10-12 metres, but can be very inconsistent. One shot might drop down at 8 metres, and the next might soar to 13. The variance in range is much greater than with most other blasters. 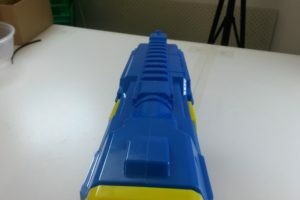 Muzzle velocity averages somewhere around 50-55fps with light blue FVJs (that’s “full vinyl jacket” Nerf-type darts, which are very similar to the included darts). This puts it very close to, perhaps a little higher than, grey trigger Elite blasters. Accuracy is fairly poor, as the range variance would suggest. Using my standard testing doorway at ~8m range, typically a quarter to a third of darts wouldn’t make it through the doorway. 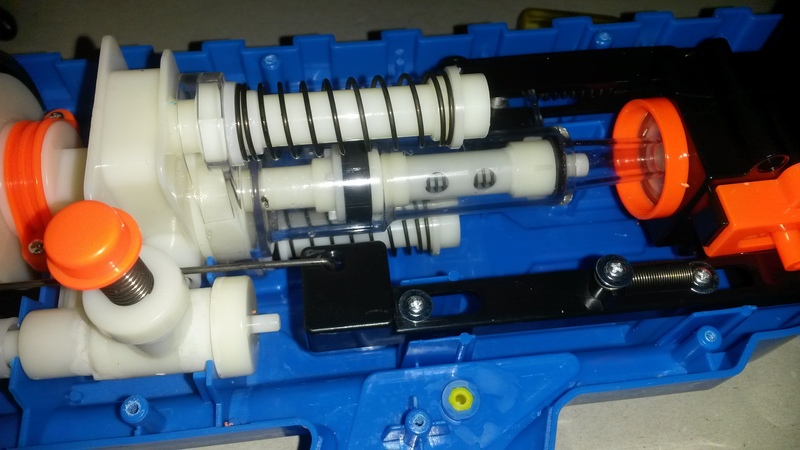 The majority of modern blasters are capable of getting at least 80% of darts through the doorway. Rate of fire is the Destiny’s selling point, and boy does it impress! The Magstrike and Rapid Madness, to which it is very similar, achieve around a 10 dart per second ROF. But the Destiny, at full pressure, outclasses even them, pumping out 15-20 darts per second — well within its box claim of “20 darts in 2 seconds”. The exact ROF is dependent on a number of variables, especially the number of pumps. A 15-20dps rate of fire is unheard of in a stock blaster, and the fact that it can sustain such a high ROF with relative ease is impressive. A ROF as high as the Destiny’s does have quite a big downside (or two): ammo conservation and fire control. 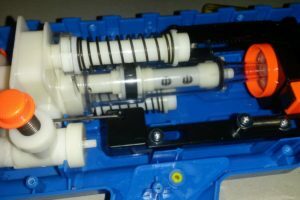 Even with high speed Rapidstrike builds, a good internal setup and a lot of practice allow for fairly reliable single and double shots. With the Destiny, however, the smallest reliable burst I can fire is 3 darts. Firing just 2 darts is achievable, but not reliable. Single shots are almost impossible. In an entire clip of 20 darts, the most single shots I’ve been able to fire is about 3, with the rest being fired in 2 and 3 dart bursts. 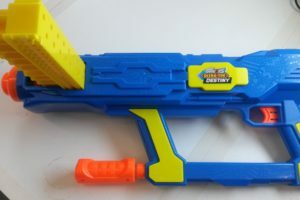 Given the large number of pumps required, and the current lack of spare clips (which is, of course, subject to change), it often isn’t practical to reload the Destiny in the middle of a game. 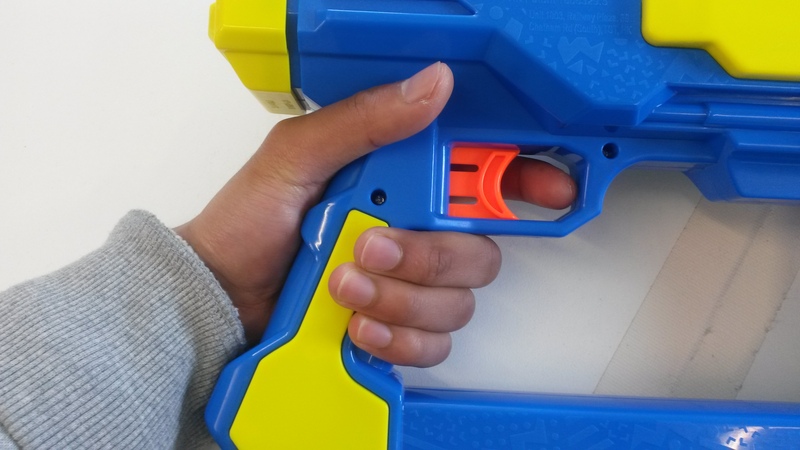 As such, it serves best as a one-use blaster for emergencies and other critical situations. It excels at putting out a huge amount of foam as quickly as possible, so it works well as a room/area clearing or area denial blaster. The Destiny’s highly variable range, fairly poor accuracy and poor fire control make it rather ineffective and wasteful in standard cover-to-cover, potshot combat. 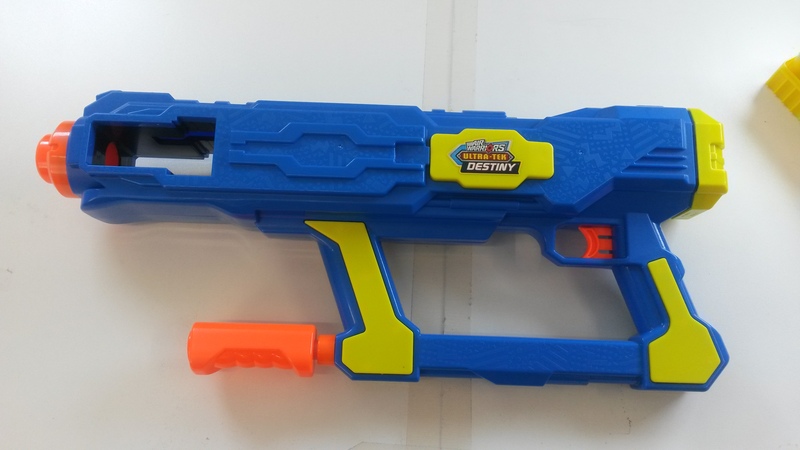 When compared to modified blasters, the Destiny loses a fair bit of its appeal as high speed Rapidstrike builds can easily reach (and beat) 15 darts per second. Furthermore, good Rapidstrike builds will also boast a muzzle velocity of around 110fps or more, depending on their exact internal setup and the darts used. 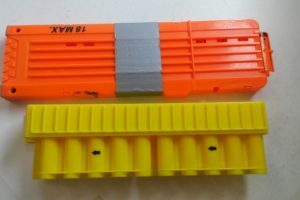 Rapidstrikes are also far easier to reload, and their magazine system is easier to deal with and more modular. 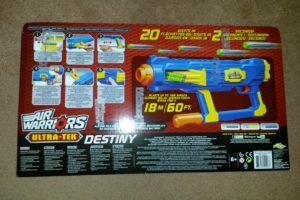 The Destiny will retail for 25USD, and should be available in the US quite soon. 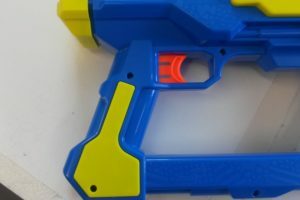 25USD is a great price, as it’s well within the lower-end of blaster pricing. It’s close to the Magstrike’s price of ~20USD when it was still available, and is much lower than the original Rapid Madness price of 50USD. Nothing in the 25USD price range comes close to matching the Destiny for raw foam output. Yes, there are blasters in that range that get better ranges and are more accurate, but few can match the Destiny for fun factor. Its insanely high ROF and visceral firing sound can give anyone a huge smile, and that in itself makes it a great blaster. Close up of the plunger system. Shot of the OPRV on the tank. 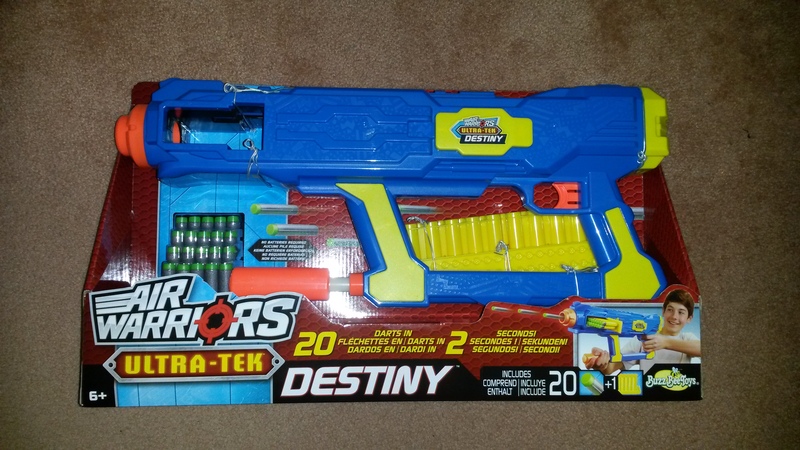 The Destiny has very similar internals to the Nerf Magstrike. It uses a hybrid of spring and air power to attain a high ROF out of a pressurised bladder. 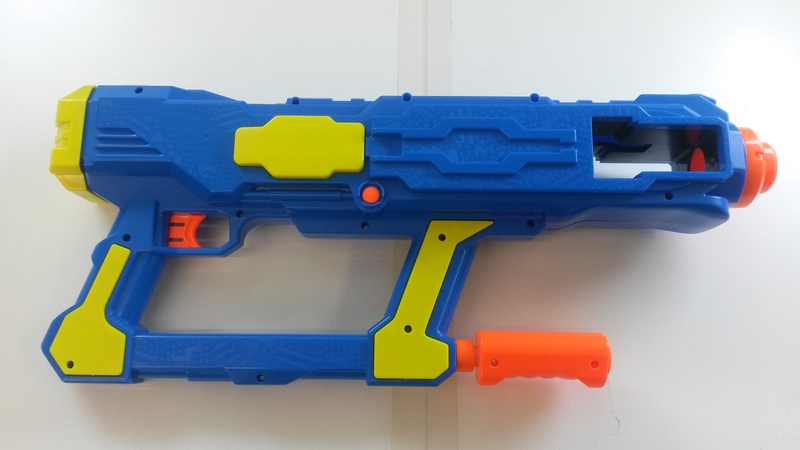 Mod potential is somewhat different versus more conventional blasters. Increasing power would be much more difficult to achieve than for more conventional blasters. 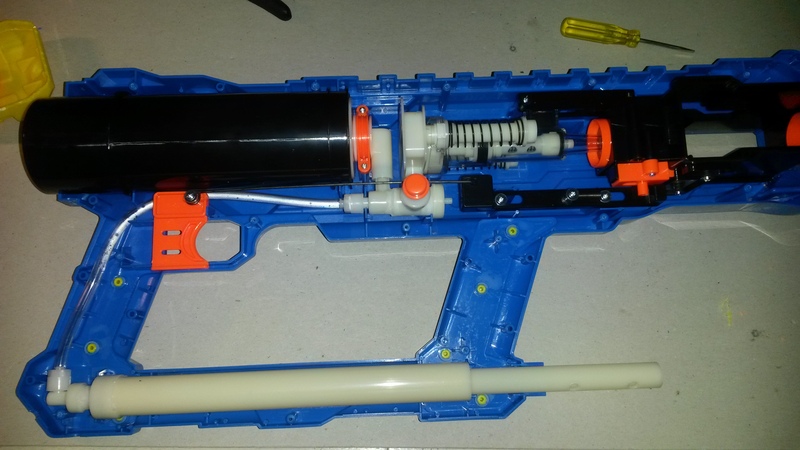 Probably the most significant practical mod would be to hook it up to some kind of HPA/LPA system to completely eliminate the need for pumping. That, combined with a bunch of spare clips, would eliminate the Destiny’s biggest weaknesses and would provide an extremely fun, high ROF blaster without the use of flywheels. 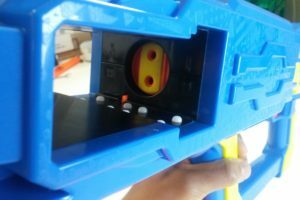 This entry was posted in Dart Blasters, Reviews and tagged 18m, 60ft, buzz bee, destiny, europe, review, ultra tek on July 14, 2016 by Outback Nerf.